Skin diseases not only bring cosmetic, but also physical discomfort. Frequent relapses and complications affect health and lifestyle, in general. Let’s talk about daily care of eczema affected skin and how to extend the period of remission. 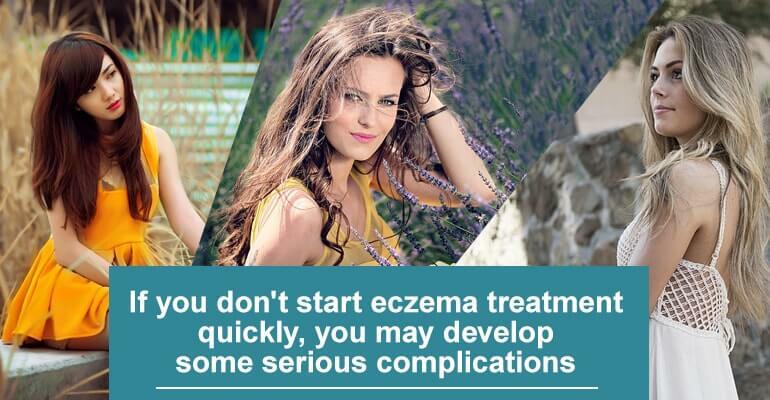 Eczema is a severe chronic allergic disease with skin manifestations. It is characterized by the appearance of small pink papules with small vesicles, which contain a serous transparent liquid accompanied by hyperemia, swollen skin. Their number can vary. Under the influence of external factors (rubbing caused by clothing, itching, etc. ), the bubbles burst, turning into erosions, or in medical terminology, eczematous wells. Wet stage is the period when a bubble ruptures and serous fluid is released. Crusting stage is the phase of drying and forming the crust. Impetiginated stage is when the secondary infection occurs. Scaly: formation of scales takes place in the stage of healing of erosions. The infiltrative stage develops during infiltration of the dermis as a result of itching. Polymorphism characterizes eczema. Remission occurs with an exclusion of triggering factors. What factor is to blame? In addition to local symptoms that exhaust patients with itching and pain, eczema is characterized by a number of common clinical manifestations: nervousness, fatigue, decreased appetite, sleep disorders. The bacterial factor can cause even more severe symptoms, such as fever, headache, etc. Eczema damaged skin requires special care to avoid complications, infection, of erosive wounds. The exclusion of a trigger, as well as timely treatment, allows the remission period to speed up and become prolonged. Eliminate the trigger. If it’s cream, soap, linen rinse, or a detergent that contacts your skin, causing an outbreak with the appearance of erosive foci – immediately stop using it. Take care of chronic foci, which can become a trigger mechanism of the disease. Try to boost your immunity by exercising and living a healthy lifestyle, which will stimulate the body’s defense system and prevent the disease relapse. 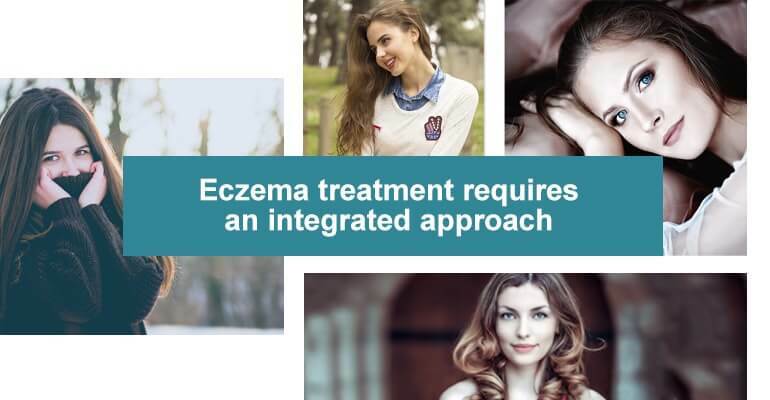 Stress and worries are not the best allies in the treatment of eczema. Eliminate these negative factors. The best distraction will be your favorite hobby, sport, yoga, etc. Try to normalize your sleep to improve your health, and it will help to make relapses less frequent. Balance your diet by including foods containing vitamins of group E, A, B, fatty acids Omega-3, antioxidants, and amino acids which are very beneficial to the skin. It is recommended to consume more natural sour-milk products, green vegetables and fruits, fish, meat and offal, vegetable oils, etc. Skin hygiene is one of the primary measures in prevention purulent complications. However, remember to use cosmetic products with only natural ingredients and hypoallergenic properties, and without fragrances and other substances that can cause an allergic reaction. After taking a shower or a bath, use a soft cloth that will not hurt the already inflamed skin. The water must be warm. Hot water contributes to the drying of the skin. The duration should not exceed 5-10 minutes. Also pay attention to the quality of the water, since the salts of heavy metals can contribute to the negative impact, causing aggravation of the disease. After a shower or bath, use a soft towel to dry the skin with gentle motions. After that, treat skin rashes with special creams prescribed by a specialist to avoid an infection of wounds or regeneration of wounds. Use vegetable oils, such as Extra Virgin olive oil, cold pressed linseed oil, or others to prevent skin from drying. Itching is the main problem for patients during aggravation. Itching can lead to the entry of pathogenic microorganisms into open wounds, and traumas can leave scars. It is especially dangerous if it occurs on the face. You can apply apple cider vinegar, aloe juice, or other products locally as a preventive measure to avoid complications. It will stop the patient from itching the affected areas, and remove the local inflammatory, foci, and puffiness. During aggravation, skin can be affected in any area, including the scalp. In this case, you should apply shampoo with a neutral pH to not cause more irritation and itching of the scalp. Using a UVB lamp in an acute period helps to remove itching and inflammation. UVB light will help wounds to heal, and prevent lesions from causing an infection. UVB treatment will reduce disease aggravation within several sessions, contributing to a longer period of remission.